So a while back the idea was planted into my head to bind the 72 spirits of the Ars Goetia to my will with a ring, and at the time I wasn’t ready to actually do it… that has changed, I am ready. So once the ring actually arrives, I’m going to be going down the list from 1 to 72 and evoking them one at a time then binding them to the ring to serve my will. Obviously I’m not doing this lightly, but I’ve reached the point in my practice where this task is to be done. As far as the actual evocations, I have it all planned out in a pseudo-solomonic way. Not going full solomonic with the pentacles and everything, but I will be basing the basic rituals off of solomonic-style evocations. With a modified version of the headless/bornless rite done beforehand obviously. Each day, after I do the evocation and binding, I will post about it here in this thread. Even though I believe that the “old ways” of treating goetic spirits are nothing more than an ignorant way of treating them, I am actually interested on knowing what would happen if someone at this time did it. I wouldn’t be doing it if I wasn’t being driven in that direction, seemingly by some of the goetics themselves. Just like Crowley to evoke his HGA? I was going to hard mode one each day until it is done. That is a very interesting direction. I’m looking forward to hear more from you. Still waiting for my ring to arrive, thinking about doing something with my cloak while I wait. Shame I don’t know enough latin to properly write out intent in it, because I’d line the inside of the cloak with latin script… Probably just gonna come up with a ton of sigils for various effects and line the inside with them. Would also be good for various purposes if I did that last thing. But not proper syntax or whatever. Sure I could do it word by word, but I don’t know how to structure any phrases or what prefixes/suffixes the words would need to mean what I want them to mean. Still waiting for the ring to arrive. It should have been here by now so I emailed the place I ordered it from, and am waiting for a response. 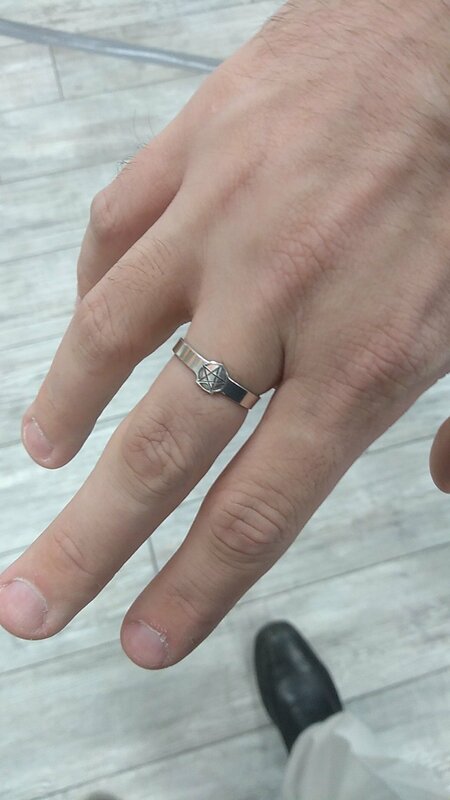 Ring finally arrived. Gonna do some crazy consecrations on the day of the full moon for it. Thanks. I’m currently gonna be wearing it to attune it to my energies, I’m more-or-less letting it soak in the energies that flow through me, so it will more easily work to my will. I will be doing a proper consecration on Tuesday with the full moon and equinox. So I started the preliminary steps to consecrate the ring. The Spring Equinox provided a unique opportunity to take advantage of. So last night, I cleared the energies of the space where I do my rituals, then an abbreviated form of the headless rite, followed by an invocation of the 5 elements, followed by an invocation of the 7 classical planetary aspects. Then I declared my dish/bowl to be the vessel of divinity, and filled it with some of the Solar Eclipse Water that I had made a while back and had been saving. After that, I called the Spring Equinox balance, and the waters within the dish/bowl the vehicle of conception of divinity. I then declared my ring to be three things, a Symbol of my ability, a Vessel for the spirits I command, and an Icon of my practice. Then I placed the ring into the water, as the act of conception, to birth that which I willed it to be. Tonight, I will be doing some ancillary rites to further empower the working, and tomorrow after the Sun rises, I will remove the ring from the water. The idea is that the Sun is Masculine, the Moon is Feminine, and on the Equinox, paired with the water consecrated under a Solar Eclipse (which can be perceived as a divine act of conception itself), the dish and waters form a symbolic womb and my ring is the ‘child’ developing before it’s ‘birth’. As far as the ancillary rites I’ll be doing, just some basic elemental and planetary empowerment. 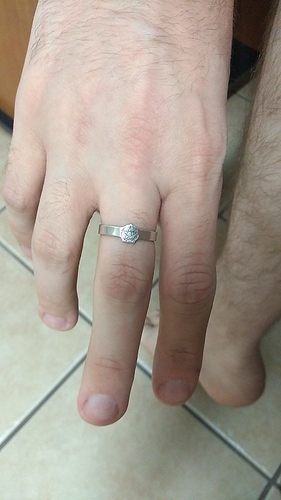 Here’s a picture of the Ring now that it’s fully consecrated. Tell me what you get off of it. When I put it on after I finished, I felt a surge of energies go up my arm and all the muscles in my arm clenched… when I channel large amounts of energies, my muscles tense up on their own as a side-effect, so for them to clench, by simply putting the ring on, it was a surprise. I already have a Quartz Point that basically is the Full Moon. Just got a Bismuth that I’ll be consecrating to be the Sun. Because having the Sun and Full Moon would be beneficial for this. Abbreviated headless rite, invocations of the 5 elements and 7 classical planetary forces, 4 candles that represent different aspects of the process of manifestation (inspiration, thought, action, and manifestation). Basically, it’s consecrated to be a vessel by which the power of the 72 will be contained, within their sigils in accordance to my will. It’s gonna be interesting when everything is done. I plan to put their sigils, names, enns, and basic information about each of the 72 on each page, more or less, make it kinda a mini-grimoire almost. I’ll be doing each of the 72’s pages right before I do the full evocation of them, and it’s gonna be interesting seeing what the book is like after all is said and done.